It’s been quite some time since I’ve completed a real DIY project. 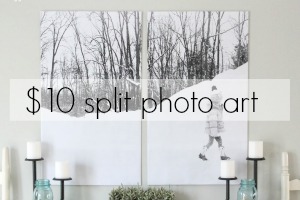 I tend to lean into the decorating side of this blog more than the DIY side. 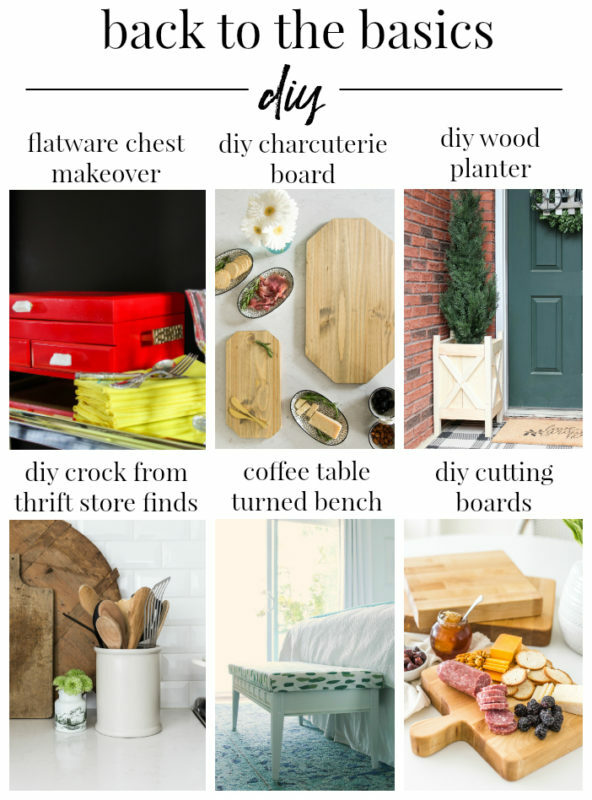 Probably because a real DIY project usually involves tools. And my husband. 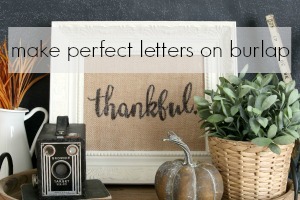 I have yet to really master power tools, so it’s just easier for me to shop and decorate than it is to get out the power tools and make something… #sadbuttrue BUT, my friend Jenna started a really fun Back to Basics Blog Hop that is encouraging me to get a little out of my comfort zone, use some power tools, and make something. 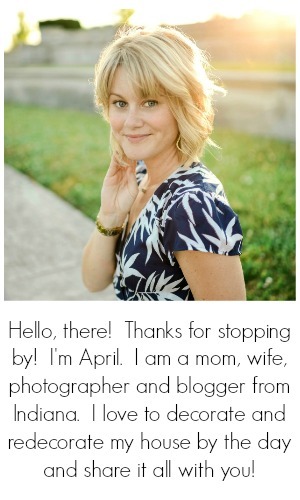 See the bottom of this post for some really cool, simple DIY ideas from some of my blogging besties! 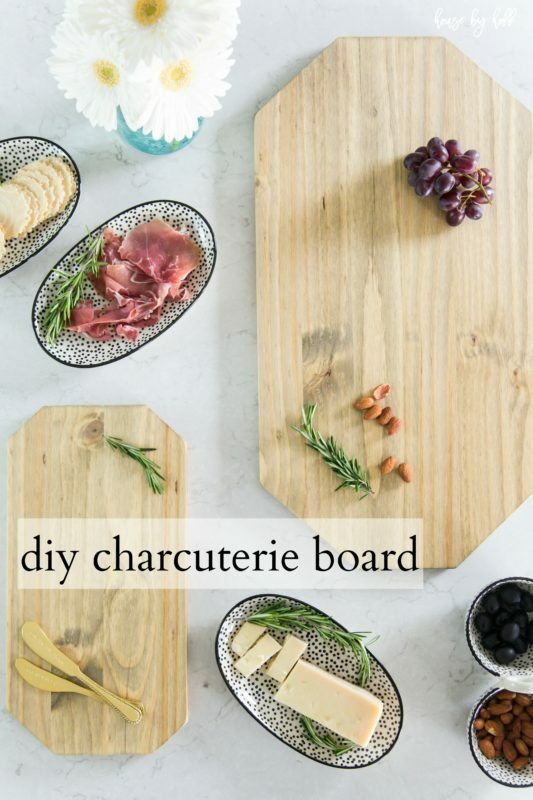 So, I decided on a DIY Charcuterie Board, because who doesn’t love a Charcuterie Board?! 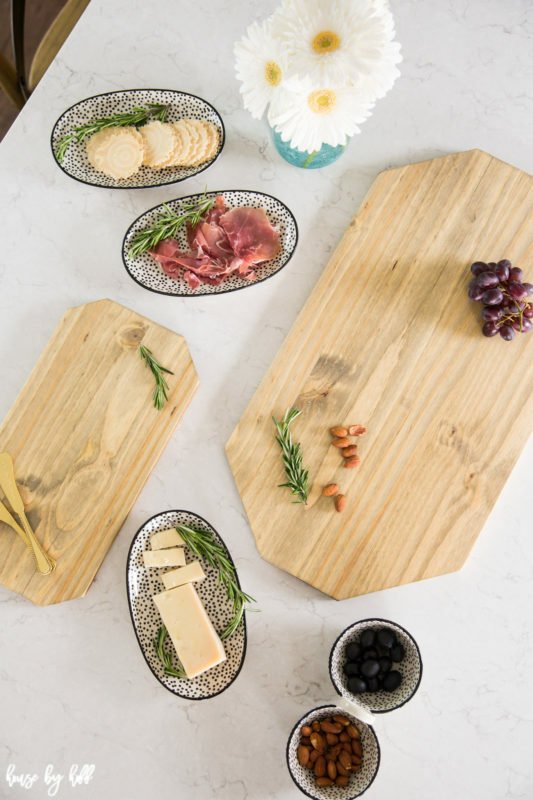 Now, I’m going to assume that you know what a charcuterie board (pronounced: shahr-cute-uh-ree) is, but just in case you don’t here goes: Charcuterie is french for dry meats. A charcuterie board is a board with an assortment of meats, cheeses, crackers, fruits, nuts, olives, etc. Basically, we’re talking about a fancy snack platter, mmmkay? Later this week, I am going to focus more on the actual ingredients of a charcuterie board, but today I’m going to teach you how to actually make the board. As in the fancy board that we put the snacks on…got it? 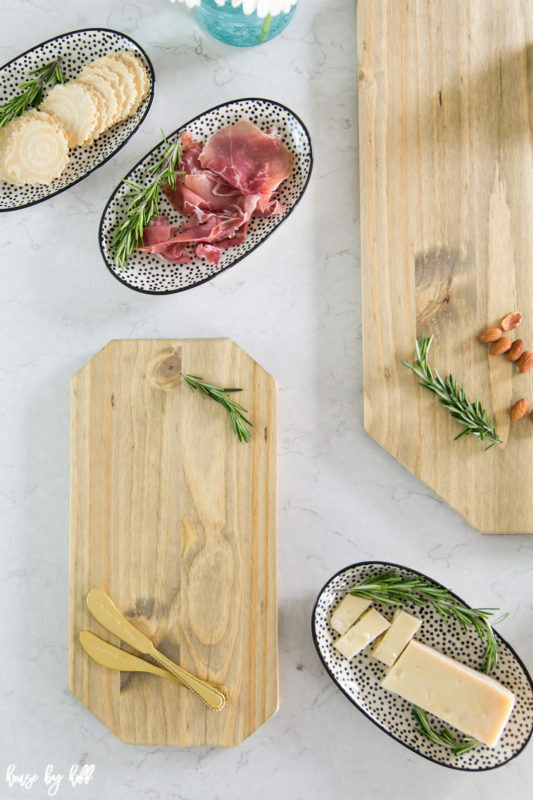 Let’s begin with what kind of wood is best for a charcuterie board. According to Google, we should be looking for a dense woods with fine grains like walnut, hard maple, birch, cherry and oak…wish I had known that before I chose pine at Menard’s…whoops! 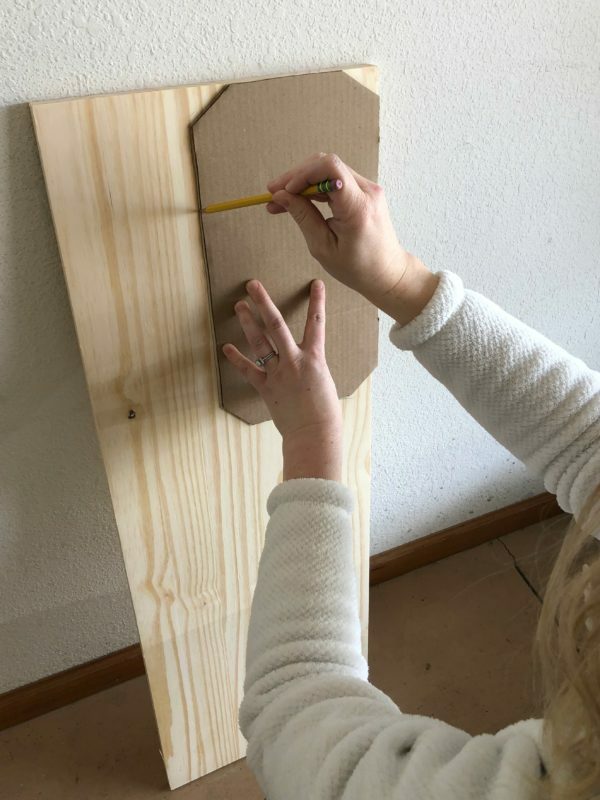 I used cardboard to create a rectangular hexagon template for my smaller board, and traced it onto the wood. The larger board was created by simply taking the left over rectangle and cutting off the corners, which gave me a larger rectangular hexagon. 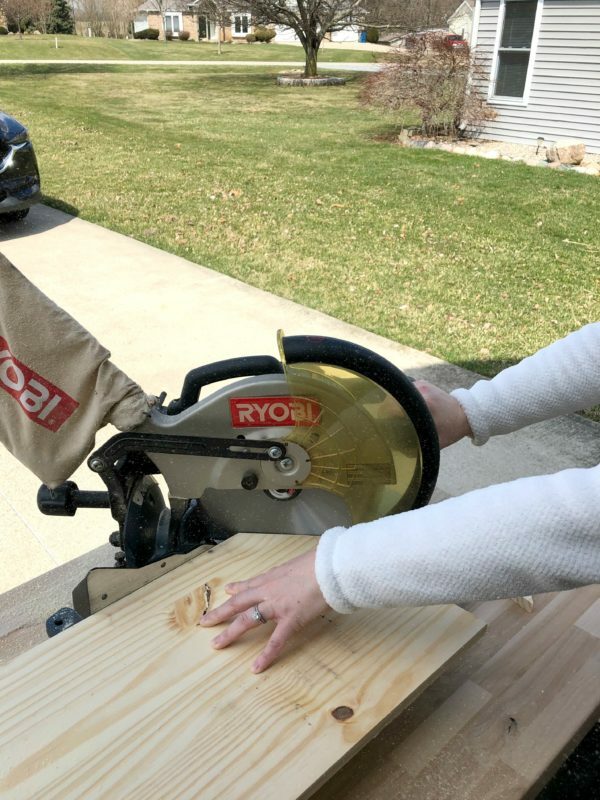 I actually used a table saw to cut out my smaller charcuterie board, but then switched to the miter saw to saw off the corners of the larger charcuterie board, as you can see below. 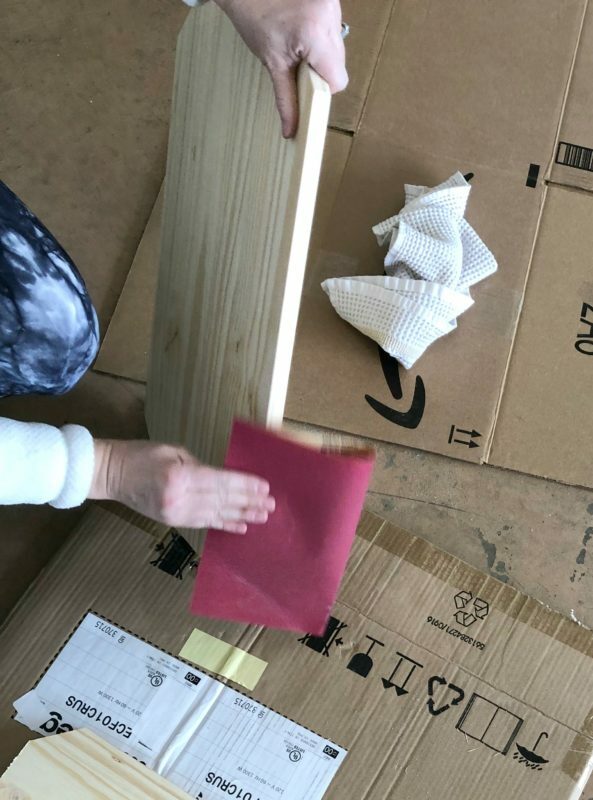 The edges and corners of both boards needed to be sanded on the sides to remove rough patches, and to create softer more worn-looking edges. 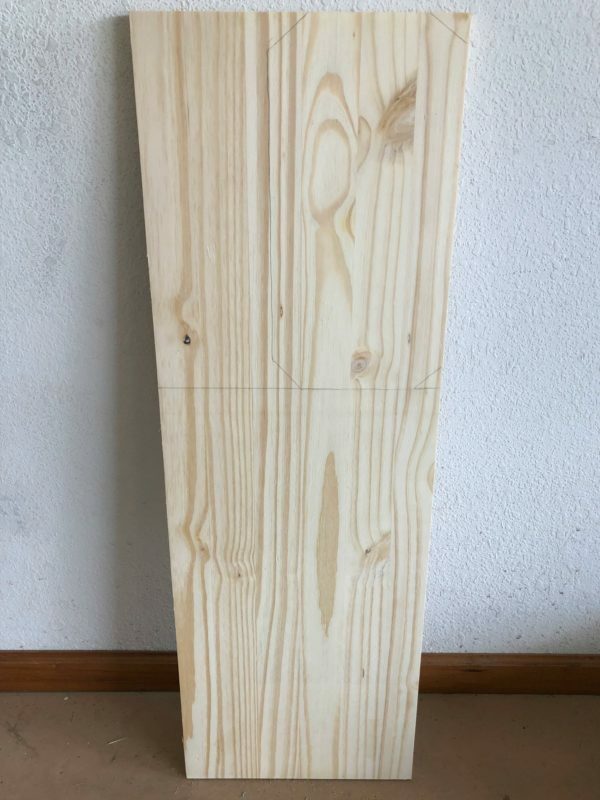 This simple step made these boards look so much more finished. 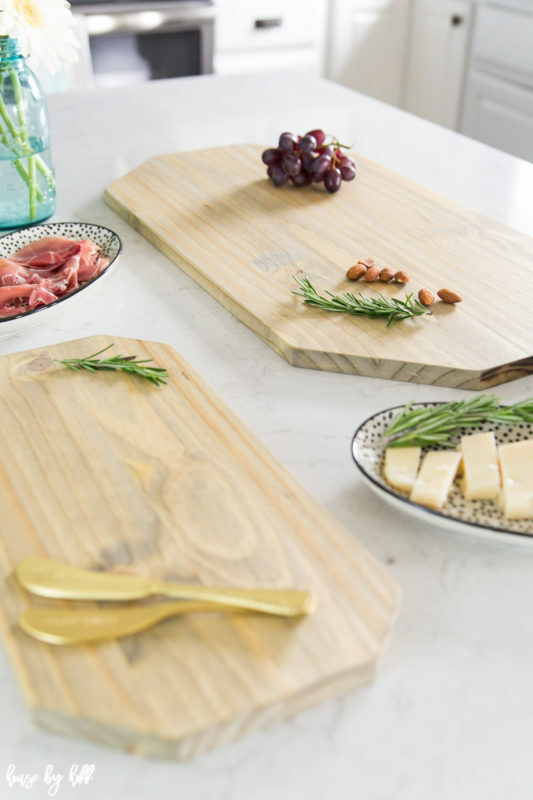 To create a food-safe and water resistant finish, you’ll want to use Cutting Board Oil. You can maintain your board and prevent it from cracking over time by using Butcher Block Conditioner. And, that’s it! 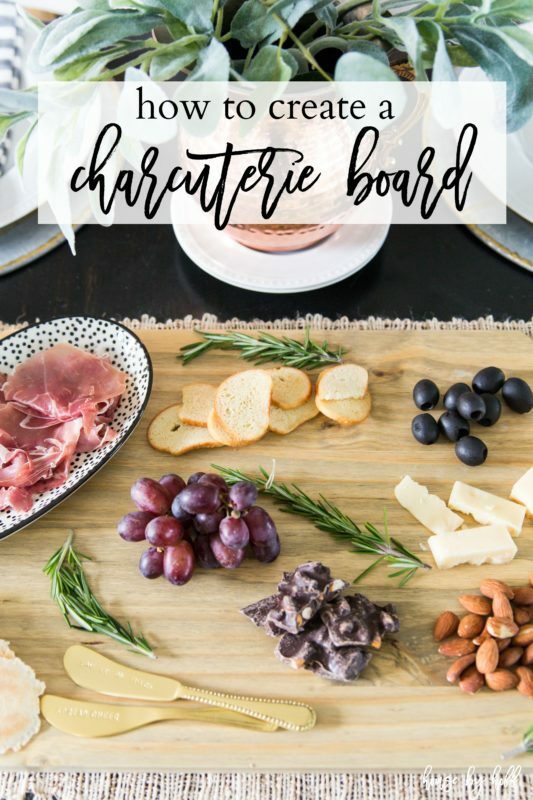 You now can make a fancy charuterie board! 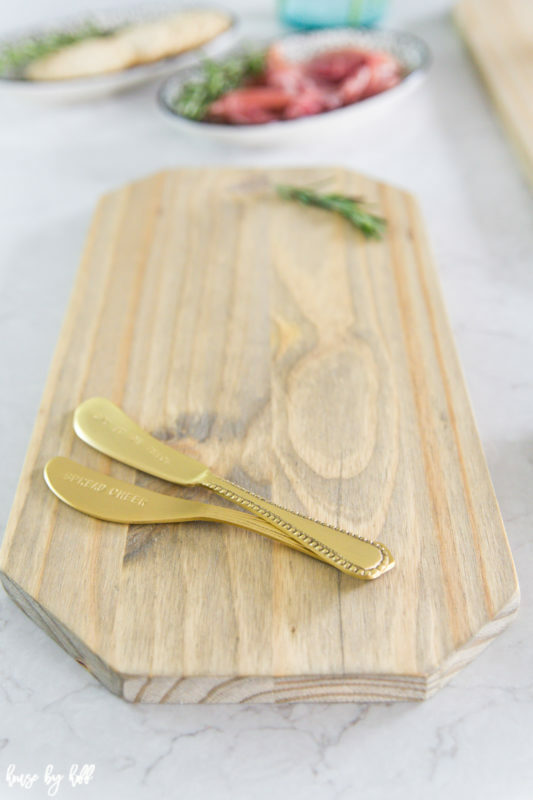 This simple DIY Charcuterie Board is a good project for those of you that are like me and want to practice using your power tools…but just want to make simple cuts…ha! 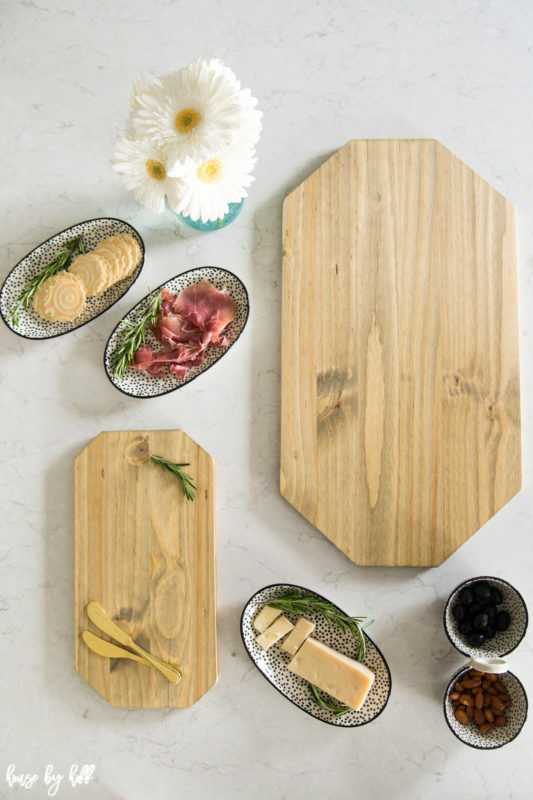 If you are not like me, and don’t really want to make your own charcuterie board, but like the idea of having one, here are some fun options I found!